My kids have outgrown playing with toys (except for one who still keeps a Barbie doll). I’m glad that I’m done with picking up toys every single day. Not that I hate doing it, it’s just tiresome. 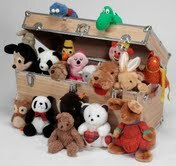 If the kids still posses their old toys, I could avail this cute doll trunk I saw online. It’s just perfect to hide the toys. It could also serve as stool or chair for kids in the play area. The trunk has wheels so it’s easy to move from one corner to another. Please click to find us here. There are more designs to choose from. This entry was posted in Kids' stuff and tagged cute trunk, doll trunk, toy trunk on January 13, 2014 by Yami.